 The radial-gradient() function sets a radial gradient as the background image. To create a radial gradient you must define at least two color stops. position Defines the position of the gradient. Default is "center"
start-color, ..., last-color Color stops are the colors you want to render smooth transitions among. This value consists of a color value, followed by an optional stop position (a percentage between 0% and 100% or a length along the gradient axis).